Supports Pale Moon [20.0 - 28.*]. NOTICE: The Browser you're using may not be supported by In The Dark for Pale Moon. If you believe this to be in error, please check your browser's User Agent settings. In The Dark for Pale Moon is free software supported by donations, not advertisements. 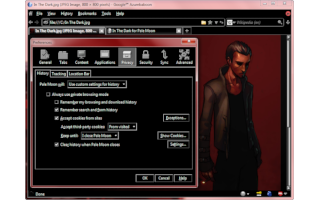 In The Dark for Pale Moon is currently under development. If you'd like to try out the latest Alpha version, it should work fine for now. I use it as my primary browser theme, personally, and make changes when I notice something bugs me. I'm also going back through the changes made during the "Darkness" phase, to make sure everything is in line with the In The Dark anti-aesthetic. If you run into any problems using this Alpha version, please add a comment below. I'll try to get to it as soon as possible. I'd particularly like to know about any incompatibilities with popular extensions, and any areas where text is unreadable. Thanks for your assistance and patience! NEW: Check out the Bloodmoon Edition! How many times can nine go into eightteen evenly? v4.3b2 installs just fine, but 7-Zip reports a "Headers Error" when extracting it. Hmm, yeah, I'm getting the same thing from the site's version. Well, there'll be another update to fix Notifications, add customized about:permissions icons, and a few other fixes pretty soon here, so don't worry too much about it. I'll double-check the next releases just to make sure as well. Best theme I've found. I wish I could change the grey text in the search box to white, and the grey icons to white or some bright colors. I really hate gray. But, still, best I've found. Scratch that about the text color in the search box. When I type it turns white. It is just the current search setting that is gray. I still hate gray but I can live with that.